Two recent releases are reviewed from this consistently excellent producer located in Elk high above the Anderson Valley. Jason Drew acquired his 26-acre ridge top property in 2005 and built a winery and home on the property. Planting of Pinot Noir started this year. Grapes are currently sourced from the Sonoma Coast, Anderson Valley, Yorkville Highlands and Mendocino Ridge. A tasting room is open Thurs-Mon 11:00-5:00 at 9000 Highway 128 in Philo, just north of the Goldeneye Winery. The tasting room is shared with several other notable producers. The associated “The Madrones” has two private guest quarters for rent; ideal for those wishing to spend some time in the Anderson Valley and explore the wines of the region. 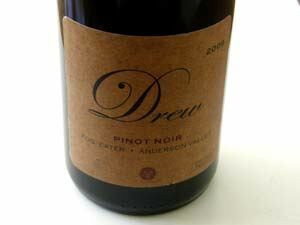 Drew wines are primarily sold through a mailing list. Visit www.drewwines.com. Jason and Molly Drew below. 13.6% alc., 370 cases, $40. From two organically farmed sites: 60% Balo Vineyard and 40% Monument Tree Vineyard. Fog-Eater is a regional Boontling term used by the early settlers of the Anderson Valley. This pejorative term is used to describe a coastal dweller, someone living on the margin. · Moderate reddish-purple color in the glass. Highly aromatic with scents of dark stone fruits and berries with hints of spice and floral bouquet picking up interest and intensity over time in the glass. Medium weighted flavors of plum sauce and dark berry jam with a grip of Asian spice and shaved oak. Perfectly balanced supple tannins and juicy acidity. Ready to drink now and over the short term. I really enjoyed the freshness of this wine. 13.4% alc., 72 cases, $40. This vineyard is located on the top of Greenwood Ridge, 6 miles from the ocean at 1,400 feet above sea level. It is a challenging site with daily maritime winds resulting in very cool temperatures throughout the growing season. The marginally fertile topsoil overlays a deep profile of sandstone and shale which roots can penetrate deeply to take up water and minerals enabling a dry farming situation. Daytime temperatures are typically 7 to 10 degrees cooler than the Anderson Valley floor. Yields are very low. · Deep purple color in the glass. Very reluctant nose offering little fruit and primarily oak. Admirable richness and intensity of fruit flavor offering a rainbow of dark fruits including black cherries, black plums and cassis. Still tight with oak and tannin in evidence. Set this aside in your cellar while you drink the Fog-Eater. Could be a wine to contemplate down the road. Very Good. A humorous name but a serious winery. Veteran Santa Barbara County winemaker Norm Yost produces small lots of Pinot Noir, Pinot Gris and sparkling wine from vineyards in Santa Barbara County and San Luis Obispo County. He is a true garagiste with a small winery in the Lompoc “wine ghetto.” A graduate of University of California Davis Enology and Viticulture program, Norm developed his winemaking skills in Napa Valley, Oregon and Australia before his love for Pinot Noir led him to Santa Barbara County. The first Flying Goat crush was in 2000. The name of the winery derives from his two pygmy goat pets. 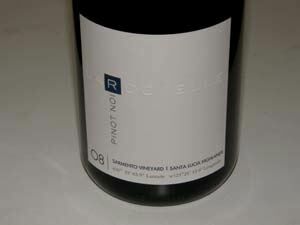 Pinot Noir is sourced from Rio Vista Vineyard and Rancho Santa Rosa Vineyard in the Sta. Rita Hills, Dierberg Vineyard and Solomon Hills Vineyard in the Santa Maria Valley, and the Salisbury Vineyard in San Luis Obispo County. The clone 23 Pinot Noir for his sparkling wine is from Solomon Hills Vineyard. Tasting is available in the “Goat Shed” winery Thurs -Sun (but call ahead to insure Norm is in town). The wines are largely sold through a mailing list. 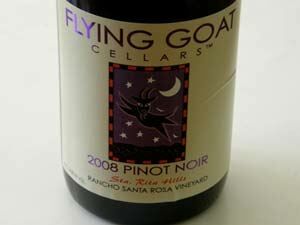 Visit the website at www.flyinggoatcellars.com or www.sbwinestore.com for availability. Saturday, August 20, Flying Goat Cellars is hosting its annual Rio Vista Vineyard Picnic and Tour. Meet at Lompoc Wine Ghetto, 1520 East Chestnut Court, take a chartered bus to the vineyard while enjoying the 2009 Goat Bubbles Blanc de Blancs. At the vineyard taste Flying Goat wines, tour the vineyard and enjoy a picnic lunch. Cost is $40 plus tax per person. For tickets, call Kate at 805-736-9032 or email info@flyinggoatcellars.com. 14.8% alc., pH 3.69, TA 0.65, 103 cases, $46. This vineyard is owned by Bill Foley of Foley Family Wines and is actually more like a quilt of many small vineyards, as each block has been planted to match the right variety, rootstock and clone for each particular slope and soil type. This wine is from the heart of the vineyard and is Dijon clone 667. · Moderately deep color in the glass. Very aromatic with showy aromas of black cherries, black plums and a hint of spice and oak. The flavors echo the nose. Modestly endowed and smoothly textured with hints of cardamon spice, raisins and oak in the background on the long finish. Unchanged the following day from a previously opened and re-corked bottle. Good (+). 14.3% alc., pH 3.50, TA 0.68, 216 cases, $44. Released September 2010. The 161-acre Dierberg Vineyard was planted in 1997 at the southern end of the Santa Maria Valley. A blend of clone 115 and 31 (Martini). Last vintage of this wine for Flying Goat. Aged 14 months in 30% new French oak barrels and bottle aged an additional 9 months. · Moderately deep reddish-purple color in the glass. On the nose there are loamy dark fruits with hints of sawdust and mocha. Medium weighted and slightly sweet dark stone fruits make up the theme. The wine is earthy and modestly tannic with a silky presence. The impression is fruit rather than nuance. Unchanged the following day from a previously opened and re-corked bottle. Good. 12.7% alc., pH 3.09, no RS, 240 cases, $32. Released December 2010. Whole cluster pressed, and vinified as if to be a still rosé. After 8 months of aging in neutral French Oak barrels, the wine was decanted into sparkling wine bottles, a tirage of sugar and yeast added and a crown cap applied. Secondary fermentation continued in the bottle. The wine was disgorged after 5 months of aging and riddling. · Attractive pink coral color in the glass. Aromatically pleasing scents of strawberries, roses and a hint of yeast. Crisp, bright and dry, with flavors of red berries (cranberries, strawberries), melon and a hint of vanilla. A thoroughly enjoyable sparkling wine and unique in its origins. Very Good. This winery (“Livermore’s best kept Pinot secret”) was profiled and highly touted in a recent issue (princeofpinot.com/article/1097/). The wines are available at www.lrwine.com. Club members are offered exclusive Pinot Noir bottlings. 14.9% alc., 138 cases, $38. Release spring 2011. Unusual clonal mix of Wädenswil, Martini and Mariafeld. · Moderate reddish-purple robe. Aromas of cherries and wooded forest. An elegantly crafted wine with appealing flavors of fresh cherries and subtle herbal oak. Firm but silky tannins make for easy consumption. Good (+). 14.8% alc., 156 cases, $42. Release spring 2011. · Moderate reddish-purple color in the glass. Nicely perfumed with aromas of black cherries, red and black berries, and spice. Intensely fruited with flavors of plums and cherry skins with savory herbs and oak in the background. Smooth in the mouth, finishing crisp. A very flavorful wine of great charm. Very Good. 14.9% alc., 137 cases, $42. Release spring 2011. · Moderate reddish-purple color in the glass. Vibrant aromas of Bing cherries, dried rose petals and spice potpourri. Tasty core of cherry pie filling with faint oak, baking spice and cola notes. Medium weighted with supple tannins. Drinking perfectly now. Very Good. 15.3% alc., 141 cases, $48. Release spring 2011. · Moderately light reddish-purple color in the glass. The nose is all oak initially, opening with air to reveal very appealing aromas of black cherries and vanilla spice. The wine possesses intense mid palate fruit of the highest pedigree yet is light on its feet (as in iron fist in a velvet glove). Delicious core of black cherry and black raspberry fruit with a touch of cola. A striking wine that is smoothly textured and finishes with an impressive peacock tail of fruit. Higher in alcohol, but not the least bit over ripe or jammy. 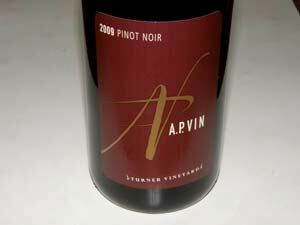 A newer producer of Pinot Noir ( first vintage was 2006) which is a premium winery within the larger Hahn SLH Estates owned by Nicholas Hahn. 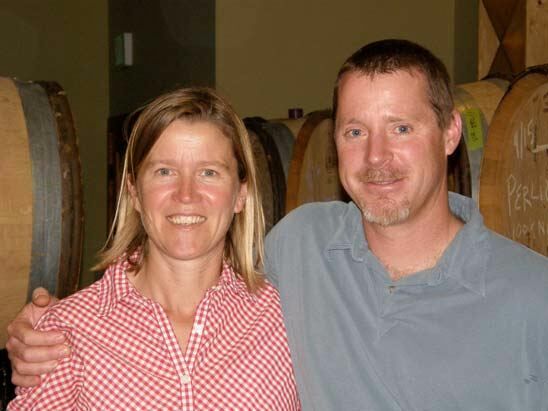 The winery takes its name from two sources: Nicky Hahn’s middle name Lucien, but in the feminine form to honor the namesake of the mountain range where the vineyards are located. The range was named by the Spanish padres who came to California to build a series of missions in the eighteenth century. Santa Lucia is associated with light; she was known for arriving with a crown of candles to bring light to the darkness during the yuletide and winter solstice. The padres undoubtedly saw the luminescence of the mountain range and called it Santa Lucia. Her crown of candles graces the Lucienne label. 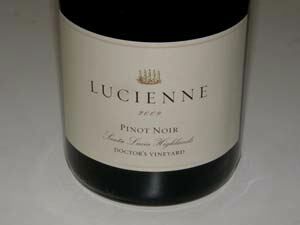 The winemaker is Paul Clifton whose recent releases of Lucienne Pinot Noir from the estate Lone Oak Vineyard and Doctor’s Vineyard have been impressive. I did not find this vintage as appealing and perhaps these wines need another 6 to 12 months in bottle. Lucienne wines are available through the Hahn Family Wines website at www.hahnfamilywines.com. 14.5% alc., pH 3.70, TA 0.61, 138 cases, $50. Released May 2011. 146 acres planted to clones 777, 115, Pommard, 2A and 667. Aged in 35% new French oak barrels. · Moderate reddish-purple color in the glass. Muted fruit on the nose with prominent smoky oak. Medium weighted array of spicy dark red fruits, with notes of oak-derived vanillin, smoke and tar. No change the following day from a previously opened and re-corked bottle. A bit muddled now. Decent. 14.5% alc., pH 3.58, TA 0.63, 647 cases, $50. Released May 2011.11 different clones of Pinot Noir planted in this vineyard of 243 acres including Calera, 828, 777 and Swan. Aged in 35% new French oak barrels. · Moderate reddish-purple robe. Aromas of ripe raspberries and cherries. Tasty core of cherries, red plums and vanilla. A lighter, elegantly styled wine with a lingering fruit presence on the bright finish. Good (+). Winemaker Joe Otos has recently released two JCO Limited single vineyard Pinot Noirs. Willowbrook is a partnership between Otis and retired technology executives John Tracy and Ed Sillari. I have had a number of intriguing Pinot Noirs from Joe who works out of a winery in the Vacu-Dry facility in Sebastopol (Owl Ridge). this past year I reviewed a Sonoma County Pinot Noir bottling that was an amazing value ($24) and won many Gold Medals at prestigious wine competitions. 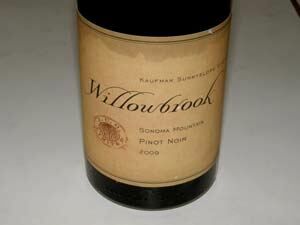 Willowbrook wines are available through the winery’s website store and some fine wine retailers. Visit www.willowbrookcellars.com. 14.4% alc., 192 cases, $42. Released July 2011. This vineyard is located between the Silver Pines and Van der Kamp vineyards in the western corner of Sonoma Mountain. 7 acres of Dijon clones and clone 23. The site receives 180-degree intense sun and intense winds in the afternoons. · Moderate reddish-purple hue in the glass. Alluring aromas of red cherries and red raspberries with hints of spice, toasted brioche and rose petals. Medium weighted flavors of red cherries and raspberries echo the aromas with supporting oak in the background. Nicely spiced with an appealing savory edge. Well-structured with fine grain tannins suggesting age ability. Very Good. 14.2% alc., 134 cases, $42. Released March 2011. Aged 17 months in French and Polish oak. This vineyard is located in the northernmost part of Marin County, an area known for late, lingering fog and intense, cool winds from Point Reyes. Vineyard management is by Mark Pasternak. · Moderate reddish-purple robe. Aromas of strawberries, dark red raspberries and loamy earth. 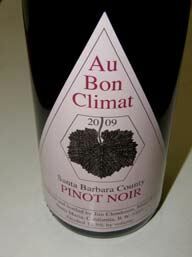 Smoky, earthy and rustic with flavors of plums, black currents and dark raspberries. The mouth feel is soft and the tannins are powdery. Bright acidity contributes a little sharpness on the finish. Good. 14.6% alc., $39, screw cap. · Moderate reddish-purple color in the glass. Shy but pleasing scent of berry jam becoming very charming with air. Dark, dense and richly fruited with an earthy undertone. Satiny on the palate with well-honed tannins and a fruity, dry finish. This vineyard has become a reliable source of outstanding Sta. Rita Hills Pinot Noir. Very Good. 14.5% alc., $39, screw cap. · Moderate color intensity. Handsome aromas of fresh berry pie and strawberry shortcake. Quite tasty black cherry and dark raspberry flavors with hints of spice and oak and a finishing note of stem and earth. Silky smooth with supple tannins. When tasted the next day from a previously opened and re-corked bottle, oak-derived coffee flavors were prominent. Good. 13.5% alc., $19. · Lightly colored in the glass. Very appealing in the glass with bright aromas of strawberries, red cherries, spice and sandalwood. Moderately light in weight with crisp and refreshing flavors of red cherries and a very slight confected tone. Silky with slippery tannins and well-integrated oak notes in the background. A modest but spirited daily drinker that will work beautifully at the dinner table. Very Good. 13.1% alc., $26. · Moderately light reddish-purple color in the glass. Nicely perfumed with aromas of red and black berries, mushrooms and forest floor. Light to medium weight flavors of dark red fruits with a slight stem and herbal note, finishing with a crisp and uplifting riff. Good. 14.4%, $30. · Moderate reddish-purple robe. Demure aromas of black cherries with heavy oak in the background and a strange “auto garage” scent. Relatively light weighted black cherry core with a burnt flavor and prominent oak. Could be an off bottle. Decent at best. 14.5% alc., 175 cases, $24. Crane Vineyard. · Moderate color in the glass. Complex aromatic profile offering scents of strawberries, cherries, cola, spice, red plum and a hint of gun powder. Tasty core of cherry cola flavor with a light tarry, toasty, smoky note in the background. Mild dry tannins and a fruity finish. Slight smoke taint but otherwise fine. Good.